Last week Judge Timothy Taylor ruled that the proposed Balboa Park redevelopment plan put forward by the Irwin Jacobs sponsored Plaza de Panama Committee violated city law and could not move forward. 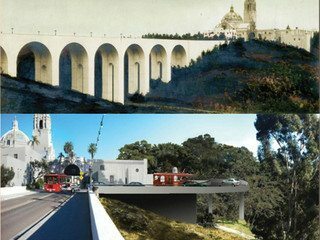 The controversial plan to remove parking and vehicular traffic altogether from the Central Mesa of Balboa Park, build the Centennial Bridge that would circumvent the museums around to the south as an offshoot of the historic Cabrillo Bridge, and build a three story paid parking structure to the south of the Organ Pavilion, would have cost a projected $45 million, with $25 million being donated by Dr. Jacobs himself. The plan was highly suspect from the very beginning, and tensions on both sides ran rather high. Shortly after the City Council voted to approve the plan, I wrote a piece explaining how the plan could very well be found illegal, laying out the several ways that the plan was legally flawed. Turns out that Judge Taylor agreed, at least in part, reaching “the reluctant conclusion” that in approving the Plaza de Panama plan, the City did in fact violate city law. In order to approve the project, city law clearly states that the City Council must find that there is “no beneficial use” for the property; that without the Jacobs plan, Balboa Park would be useless to the public, the entity for whom the park exists. “The court reaches the reluctant conclusion that the City violated section 126.0504(i)(3) of the Municipal Code, because there is no substantial evidence in the record as a whole supporting the determination that there is no reasonable beneficial use for the project area absent approval of the project,” wrote Judge Taylor in his decision. In the wake of the ruling last week, Dr. Jacobs made good on his promise to withdraw his support. Jacobs told KPBS that he had not seen any alternative plans to remove traffic from the Plaza de Panama while “still serving the needs of the museums and other institutions inside Balboa Park” that met his requirements for his support. The Plaza de Panama plan’s demise was entirely predictable. It’s not that the public does not support making improvements to Balboa Park. They do. And it’s not that the public doesn’t appreciate the generosity of Dr. Jacobs in his offer to contribute $25 million out of his own pocket to make those major improvements. His motivations aside, it was an incredibly magnanimous gesture, one for which he would derive no direct benefit other than to cement his legacy and his place in San Diego history. The trouble stemmed entirely from the process, and the perception Dr. Jacobs tried to sledgehammer his own desires through the City Council. This was the plan, take it or leave it. He made it clear all along that failure to accept the development plan as presented, with no modifications, would result in his decision to remove his support for the project altogether. It came across as a very rich guy holding the city hostage in order to get his way. But there were other alternatives, including the original Balboa Park Precise Plan put in place more than 20 years ago but never acted upon. No other alternative, however, was given serious consideration by Jacobs and the Plaza de Panama Committee. It was noted that the Plaza de Panama Committee held some 200+ public meetings on the renovation of Balboa Park. But those meetings would appear to be more informational rather than collaborative. Just because the Committee held those meetings doesn’t mean that they accepted and integrated any input from any other participants. “While the major elements of the Plaza de Panama project did not change, many details were changed because of the public input received,” said Katie Keach, the Deputy Chief of Staff for City Councilman Todd Gloria in response to an email inquiry. However, Keach did not identify what details were changed. No other member of the City Council responded to my request for comment. Jacobs’ take-it-or-leave-it ultimatum is what ultimately killed the plan (at least for now). Had he and his Plaza de Panama Committee been more open to suggestions, more amenable to less invasive—and less expensive—options, we might not be where we are today, and the project might still be moving forward in a manner that did not by necessity violate the city’s Municipal Code. Which brings us to the shocking arrogance of the San Diego City Council, particularly that of new Council President Todd Gloria. The City Attorney, at the behest of the City Council, argued that the judge could simply ignore the law, that there can be “’unreasonable beneficial uses’ which the City is free to reject in favor of the one deemed more beneficial,” explained Judge Taylor in his ruling. “Respectfully, this strikes the court as re-writing the Municipal Code. The City Council did not enact language permitting alteration if it determined that the proposed alteration would result in a more reasonable beneficial use; rather, it required that there be no reasonable beneficial use absent the alteration,” he wrote. “The City abused its discretion in making the finding of “no reasonable beneficial use of a property,” Judge Taylor concluded. But that is not going to deter Gloria, who is asking the City Attorney to find a way around the law, including the possibility of issuing an exemption to the city’s Municipal Code. Gloria essentially thinks that the City can and should ignore its own laws, despite the fact that Judge Taylor explicitly noted in his ruling that the City must follow its own laws, which demonstrates an egregious lack of judgment on Todd Gloria’s part. And it is this kind of arrogance that allowed such a flawed plan to pass through the City Council in the first place. This attitude—the belief that the city can violate its own laws when it is deemed convenient to do so—should ring alarms for all residents of San Diego. The plan was also likely to cost the taxpayers of San Diego tens of millions of dollars, as there was a provision in the original agreement between the City and the Plaza de Panama Committee that stated that if the cost overruns for the project exceeded 3% of projections, the Committee could opt out altogether and the city would be left to cover the entire cost. It was also nearly a sure thing that the paid parking structure would fail to meet the Committee’s revenue projections, which would result in a loss of almost $1 million or more annually out of the city’s general fund. This was a deeply flawed plan from the beginning, made so because the outcome was predetermined by the Plaza de Panama Committee and validated by a complicit City Council. It’s a shame that Dr. Jacobs put himself in a position to be so maligned, but the reality is that he has no one to blame but himself. He wanted to do something good for the city, and for that he should be commended. But it was the manner in which he wanted to impose that good that brought such negative attention in his direction. It didn’t have to be this way. It could have and should have been avoided if he and the Committee had been more open minded, prepared to accept input from other stakeholders. Instead, proponents of the plan held an audacious assumption that they were above the law and beyond accountability to the general public to whom the park belongs in the first place. There’s a reason laws exist. Simply because someone is rich and powerful does not mean they should be allowed carte blanche to circumvent those laws, no matter how good their intentions. In this city of frenzied redevelopment, Balboa Park is one of the few constants that we can depend on through the years. It is a part of San Diego’s long-term identity and history. It is close to the hearts of long-term San Diegans. It is good news that Irwin Jacobs is not going to get his way. Don’t fix it if it is not broken. Leave well enough alone.